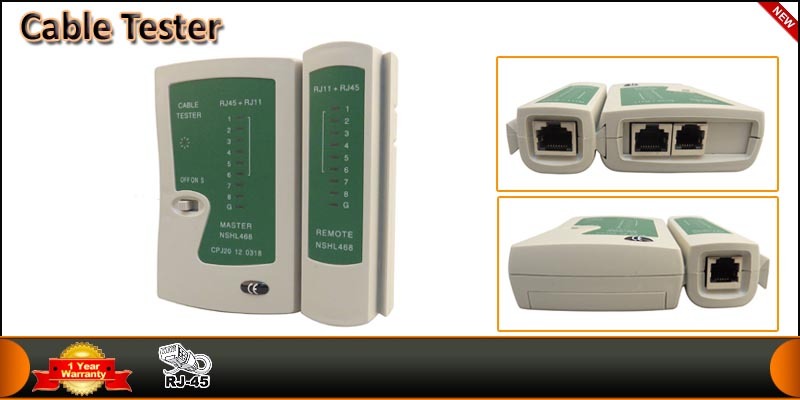 This LAN Network cable tester is required for network installation of RJ-11, RJ-12, RJ-45, CAT5, CAT6, 10/100BaseT, TIA-568A/568B, AT&T 258-A. RJ45 network cable tester tests double-twisted cables 1, 2, 3, 4, 5, 6, 7, 8 and ground, 9 LED lights to indicate wiring connection on both remote and master unit. With this network cable tester, you can judge wrong connection, short circuit and open circuit. Compact and light weight Network Cable Tester, useful for home and outside use. Quickly and easily check RJ45 network cables and RJ11 cables. Ideal for I.T enthusiast who wish to make their own network cables. Operates from a single 9V PP3 battery (not supplied). Automatic scan for the wrong wiring or disorder cable. Test length depended on the battery condition. 1 x Network Cable tester.